Institute for Research and Community Service (LPPM) IPB University (IPB) received a visit from Empowerment Activists and Family Welfare Team (TP-PKK) West Kutai, East Kalimantan. The purpose of this visit is the TP-PKK Kutai Barat wants to cooperate in terms of processing and utilization of one of the commodites in West Kutai, namely Dayak Onions in a modern way, because during this time the local people still cultivate in the traditional way. This was stated by Chairman of the TP-PKK West Kutai, Yayuk Seri Rahayu, S.ST Courtroom LPPM, Dramaga Campus Bogor on Thursday (21/3). 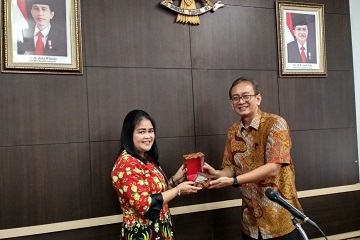 According to Yayuk Seri Rahayu, previously West Kutai has been cooperating with IPB in the field of cultivation of Doyo which is a special plant for the manufacture of woven fabrics typical in West Kutai. Yayuk hopes this cooperation will be further enhanced by IPB with the use of Dayak Onions. "Dayak Onions have been developed in West Kutai and so far people use it as a traditional medicinal plant. We also want to know more about the content and benefits of the Dayak onions, especially in processing into a form more practical for example as in the form of a kind of tea beverage packaging, "says Yayuk. He added that the processing of Dayak onion is still done in a traditional manner and is not optimal has become one of the obstacles in the promotion of processed Dayak onions of West Kutai. With this partnership LPPM can provide training and guidance to the community so that the potential of West Kutai community resources can be put to good use. In response, the Head LPPM, Dr. Aji Hermawan said TP-PKK visit West Kutai is the first step to create a partnership with LPPM. "In this regard we can learn from each other, IPB could learn the things that are coming from the local community so that IPB can provide scientific support," he said. He added that, besides the market also has a very important and significant role, so that the product can be accepted by the public. In producing a product it must be considered good quality and packaging, so the product will be well received by the public. TP-PKK entourage West Kutai accompanied LPPM team then headed to Dramaga Station in Dramaga to receive training directly by the Head of Service to the Community Program LPPM, Dr. Prayoga Suryadarma of the processing of the Dayak onion to be processed into beverage products.